Visual learner? Watch me make these homemade flour tortilla from start to finish? I’ve been in a back-to-basics mood lately and have been making everything from scratch. 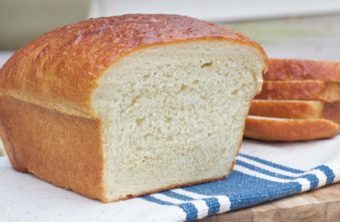 I’m pretty much a homemade girl anyway,( I mean hello homemade laundry detergent) but there are some things that I usually always just pick up from the store and bread is one of them. Over the years I’ve been trying to make more bread recipe at home. 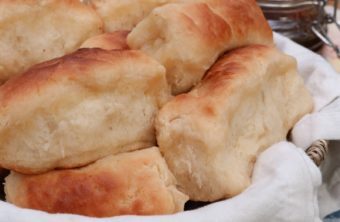 Once I finally got yeast to like me, I’ve had great success with this sandwich bread and these yeast rolls. It was only a matter of time before I found a really good flour tortilla recipe that I liked. I’ve tested out a few recipes and, really, they’ve all been pretty good! Most of them consisted of the same 4 ingredients flour, salt, baking powder, and fat. The fat is usually in the form of lard, shortening or oil. I prefer my homemade flour tortillas with shortening. I think the oil makes for the prettiest looking flour tortilla but the shortening just gives it a taste and texture that makes me want to gobble them down plain as soon as they come out of the hot pan. These homemade flour tortillas have taken our weekly taco night to a new level! So much so that the kids are like “oh….we’re using store tortillas tonight?” whenever I don’t make them homemade. Pshhhh, these kids I tell ya! I can’t blame them though, homemade flour tortillas are amazing! Nothing but soft, chewy, puffy, floppy deliciousness. It upgrades WHATEVER you put in between them! You really don’t realize just how “unfresh” and dry store-bought tortillas are until you’ve had them made from scratch. 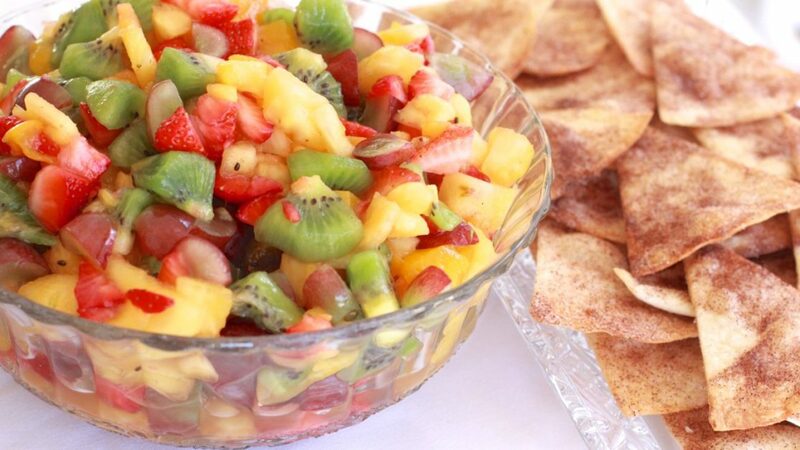 They taste soooo good slathered in butter and cinnamon sugar and paired with this fruit salsa recipe. 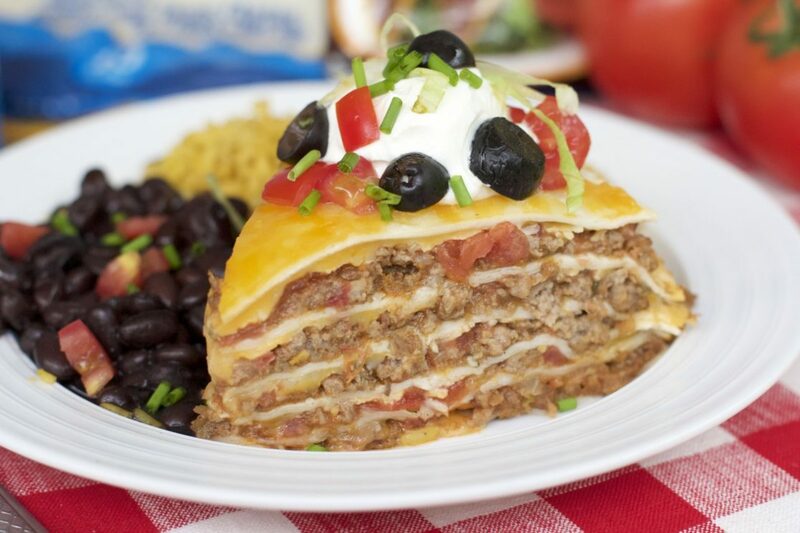 Or with one of my hubby’s favorite dinner’s, taco bake! 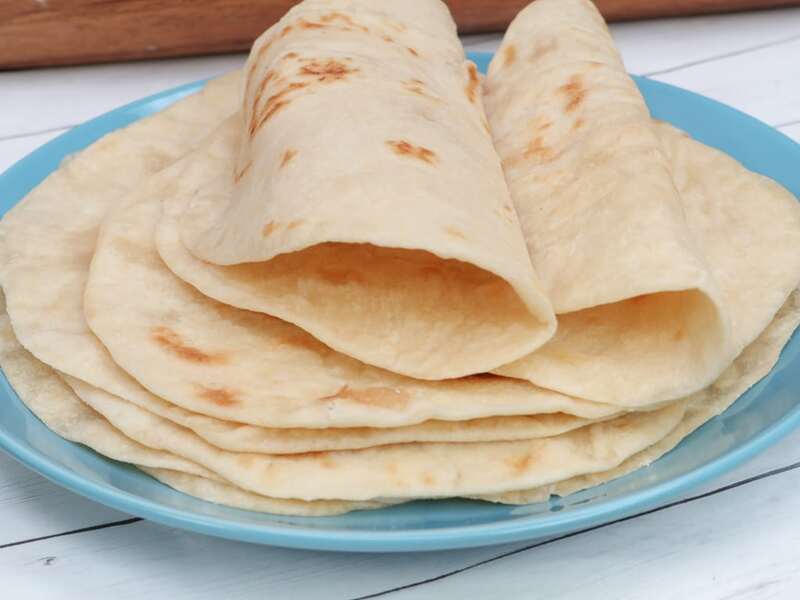 No matter what you do with these flour tortillas, I’m sure you’ll love them! 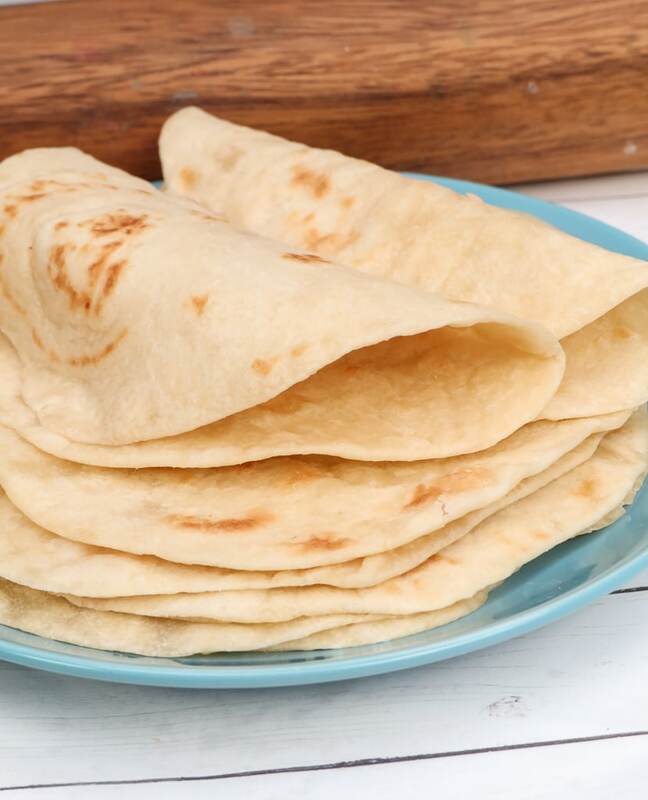 Here are few tips to ensure you get the BEST flour tortillas ever! How to make the BEST Flour Tortillas! Roll them really, REALLY thin! As thin as you can get them without tearing up. I roll them on parchment paper because it makes it really easy to transfer them to the pan. Your tortilla dough should be soft and stretchy. If it’s crumbly after kneading you’ve added too much flour. If it’s sticking to your hands, add bit more flour. If you do not have a tortilla warmer, create one with using a pot with a tight-fitting lid. Stack the tortillas between layers of barely damp paper towels and then place the lid on the pot. THIS IS A MUST, if you want your tortillas to be soft and pliable for days. In a large bowl whisk together flour, salt, and baking powder. Cut in shortening using a pastry cutter, until mixture is crumbly. Create a well in the center of the bowl and pour in the hot water. Gently mix the flour mixture into the water, stirring until a dough forms. Flour your work surface lightly and dump the dough onto the work surface. Knead gently until the dough becomes soft, smooth and stretchy. Divide the dough into 8 even-sized balls. Cover with a damp cloth and allow the dough to rest for 15-30 minutes. To roll out the tortilla, place a ball of dough on a piece of parchment paper and flatten slightly with your hand. Starting with your rolling pin in the center and roll up. Come back to the center and roll down. Return back to the center and roll out on both sides. Repeat until your tortilla is super thin. Place the tortilla into the skillet. When the underside has a few brown spots, flip and cook the other side. When done, place tortillas in a tortilla warmer or a pot. If using a pot, separate the tortillas between layers of barely damp paper towels and place the lid on the pot so that no steam escapes. This will keep them soft and chewy! Repeat until all of the tortillas are cooked and then remove the paper towels. Store cooled tortillas in an airtight container. Your tortilla dough should be soft and stretchy. If it's crumbly after kneading you've added too much flour. If it's sticking to your hands, add bit more flour. Most recipes suggest not using butter or oil on the pan because this will cause the tortillas to become crispy. This is true! 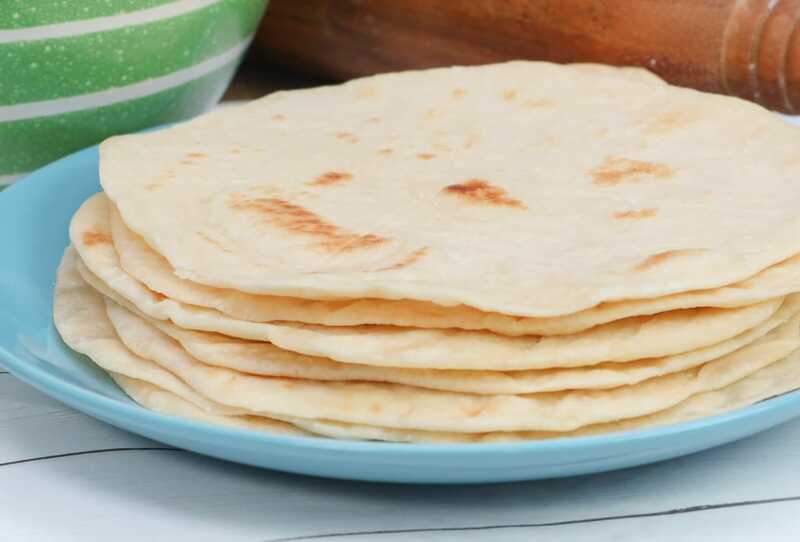 However butter gives such and amazing flavor and placing the hot tortillas between layers of damp paper towels will steam them to perfection, making them soft and pliable DON'T SKIP THIS STEP.